Happy Needle and Thread Thursday, y'all! Just after last week's party, we left for what my husband likes to call "the tour of the Gulf Coast" to see both of our families in Texas and Louisiana; which culminated in dropping off my wild thing to spend the week at my parents' house. He spends this time with them every summer and I love that he looks forward to it so much. Since getting back on Sunday evening, I have been taking it easy, and though I'm missing my sidekick this week, I must admit that the quiet house is nice. In the past couple of days, I took the scraps from my Indian Summer quilt and made a quick, modern coins baby quilt in a flash. 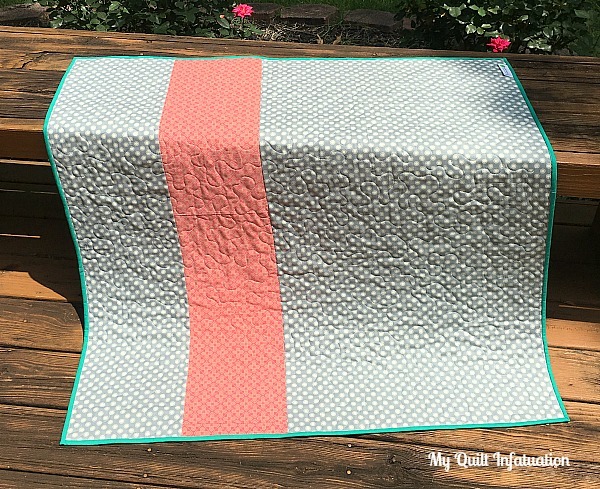 I pulled a gray Denyse Schmidt polkadot from my stash for the backing, and added a coral tonal stripe for a little bit of fun. The DS print is one that is no longer available, and I had a tough time parting with it. A wide stipple keeps this quilt nice and soft; perfect for baby snuggles. 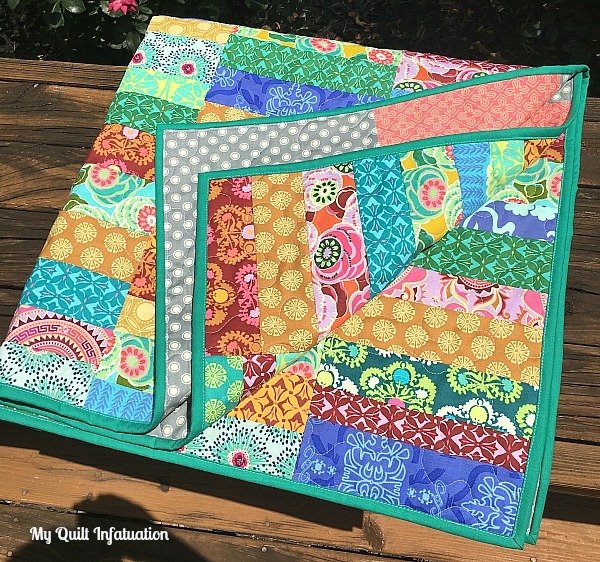 I had just enough Kona Kelly Green leftover from my Indian Summer quilt to bind this one, and I just love the pop of the vibrant green with all of those rich Amy Butler prints. This little quilt measures 42" square, and I love how it turned out! Before we party, let's check out last week's party features. 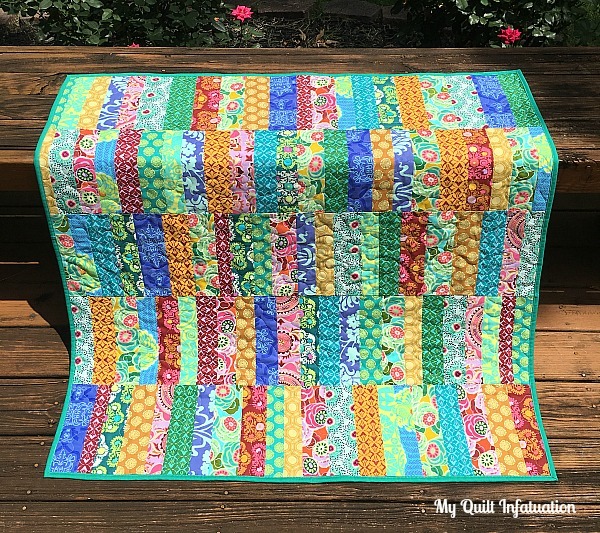 This quilt by Tisha at Quilty Therapy is called Scrappy Unicorn Rainbow Sprinkles, and it is so happy! These fun flamingoes are by Tanya Quilts in CO; perfect for summer! and this scrappy flowering snowball quilt is by Dreamworthy Quilts. Love it! 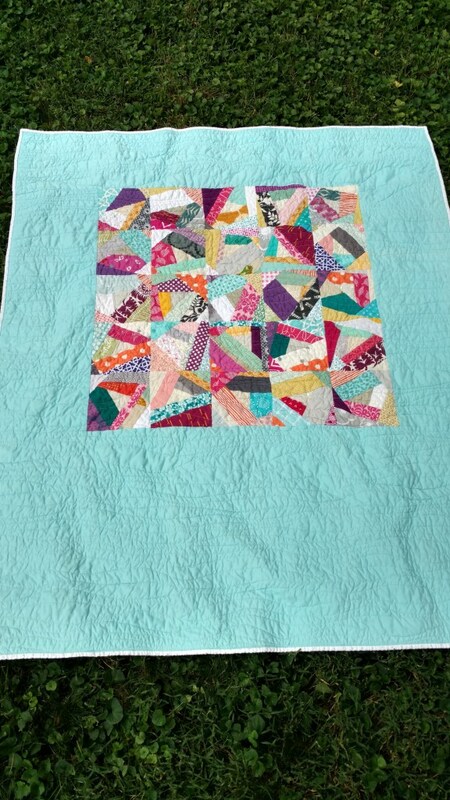 What a pretty baby quilt! I love all the different greens! Great scrap quilt and the green is perfect for the binding. Thank you for including my Scrappy Unicorn Rainbow Sprinkles Quilt! Any chance you would mind correcting my blog name to Quilty Therapy, the y is missing on the quilty party? oops! sorry about that. it's correct now. Lost your links? Can't seem to find any of them for this week or before? I don't know what's going on. They are showing up just fine for me. Maybe try closing your browser and reopening? So beautiful fabric and as always love your fabric combo.Great job!! What a wonderful quilt - so colorful. Thanks for sharing it. Love your coin quilt. The fabrics really look great together. Hope you have fun during your "quiet" week. 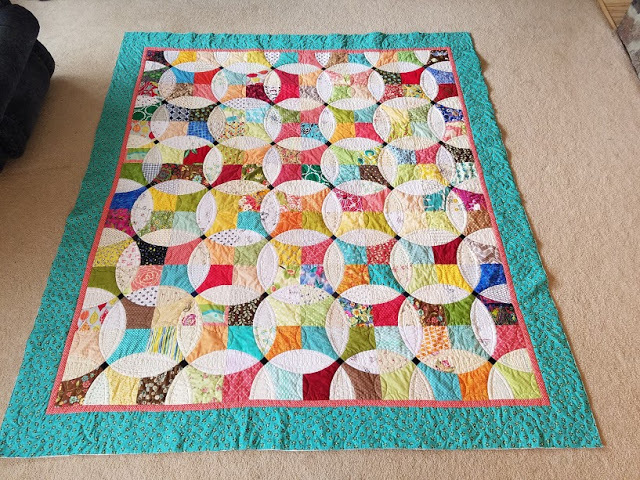 The Coins quilt is bright and cheerful. Thank you for sharing! I also appreciate you showing us the other ladies' fabulous quilts.